William chuckled a bit at the reply from Earth. Routine was a fairly subjective term when one got down to it. As a PJ he didn't think twice about jumping out of an aircraft into potentially hostile territory. For your standard infantry soldier however, that wasn't something considered routine. "For an offworld mission, yes Chief I would say it was fairly routine. We arrived, found the bad guys and took them prisoner. All without losing any of our own. SG-18 is present on the ground with us. The Normandy is in orbit along with a vessel belonging to Fairs who lays claim to the prisoner." "You'll be the first to know Colonel if anything happens that we're not expecting." He glanced up at his CCTV camera feeds. "Doctor Mac is still with General O'Neill ma'am, so I'd be pacing myself in getting to her rooms if I were in your place. Take it easy, grab a cup of coffee or something." Now he had to attend to SG4. "I'll take this and Colonel, I will keep you up to date, that's a promise." "Copied Lieutenant. Get back to your team. I'll inform the Admiral. I'll dial back in when I have an answer from him. SGC out. Good job by the way." He pressed the coms panel to connect with the briefing room. "Admiral. SG4 has checked in with their latest report. They caught two Jaffa and one Goa'uld on the site. Coincidentally one of Lord Khnum's Hat'aks showed up to negotiate for their release. What shall I tell them sir? Oh and the Normandy is there as well watching over things." So, it seemed she did have a few moments to herself. And a nice hot cup of tea sounded great. Coffee actually would have worked, but she was trying to limit her coffee intake while pregnant. It stunk though. Sarah turned to leave, but then remembered that she hadn't actually gotten a direct answer about Ben. "One more thing, Walter and then I'll leave you alone," she promised. "Ben MacGregor. Has he made it back yet? I promised Anne I would find out and let her know." "Inform SG-4 they are cleared to proceed as they see fit, up to and including retaining any prisoners they feel are necessary to hold. If they need someone higher up the chain to speak to Khnum, I believe General O'Neill is still here and I'll be available in about ten minutes. Thank you." "Dang, I forgot him didn't I?" He said to himself as he gathered his wits. "Yes well Ben, I mean Lieutenant Colonel MacGregor beamed in before the rest of them, I saw him a while ago on the video feeds leave Med Bay, couldn't have been more then five minutes. He has his arm in a sling but well ma'am if he's injured badly his face doesn't show it. I think he'll check in with the Doc soon enough." Back to the Admiral. "Yessir, I'm sure Colonel Ovcharenko will be pleased to know that Admiral. Walter out." "Colonel, it's fine really, I mean what else am I going to do. Now go on, don't let me get all grandfatherly on you." He'll call SG4 back as soon as she was on her way, hopefully to relax. A smile touched Sarah's lips. "Okay, I can tell when I'm not needed anymore," she chuckled. "And thank you for the update on Colonel MacGregor. Anne will be happy if she hasn't seen him already." Sarah hid a yawn behind her hand before turning. "And I think I will take that brief stop off to grab a warm drink." At least it would give Anne a bit longer to finish her meeting with the Admiral. "I wouldn't dream of making you have to do that," she teased Walter before heading out the door with a wave. "No ma'am." He said innocently with a wry smile on his old face. Then without delay he re-dialed the Dig Site. One by one the chevrons locked into place until the last then the Puddle opened up the event horizon. "SG-4, this is the SGC. Greetings from Admiral McRaven. His orders are as follows....you are cleared to proceed as you see fit, up to and including retaining any prisoners they feel are necessary to hold. If you need someone higher up the chain to speak to Khnum, General O'Neill is still here and the Admiral be available in about ten minutes." He knew things were busy so he added. "I'll shut the gate down now, dial back with your next report when you can." Sending that off, he waited a few moments then closed the gate once again. "Stargate Command, this Captain Coffin with SG-7, calling from P4H-51Y. We've made a major discovery here. I'll get straight to it, we're going to need a team to do a follow up on our find here, but, well...we found a mine that has the raw materials to make ZPMs. How copy, over?" With a slight break in routine for Walter so he took the opportunity to make himself a nice hot Chai, something his youngest son had gotten him into after all those College trips to Sri Lanka the boy took on the excuse of field studies for his archeology course. Walter and his wife highly suspected a girl was involved and as parents they were on the money when Aaron asked them about what was involved in sponsoring overseas students. It turned out quite well in the end, the girl was a charmer, part Sri Lankan and part English with a smile to melt the heart. Thinking on those family matters and the fact that Aaron was most likely to be married before his oldest brother, his reverie was broken by the gate activation. He was rather startled by the news to say the least. "Captain we're receiving you loud and clear. I can't say we couldn't use the good news and I know our scientists will be over the moon. Did you pick up a sample as we could have it analysed to be sure. I'll let the admiral know immediately, stand by SG-7"
He tapped on the intercom once again. "Admiral, its Walter sir. SG-7 from the Alpha Site has just radioed in from P4H-51Y, they need a follow up team to get back there. From Captain Coffin's report sir, he's telling me that they might have found what appears to be the base crystals ZPM's are made from." Not that he doubted it, the whole thing was something that many had dreamed of ever since they first found out the existence of those Ancient artifacts. Ian made his way down to check on things, catching Walter's report on the way down. "Thank you, Chief. I..." Ian was interrupted by Jack stepping past him. His urgency was a bit confusing to Ian, wondering just what was said in his office while he was with SG-9. "I'm sorry to interrupt, can I have that for a sec?" Jack asked. But he was already at the comms terminal before Walter could reply. "SG-7, this is General O'Neill. First of all, good work, great find, I'll make sure you're all properly recognized." Jack said. Ian knew Jack would have seen to that anyways, but to downplay finding something this huge? What was going on? 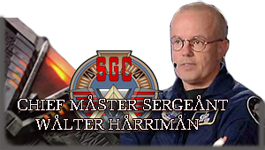 "SG-1 has missed report-in. At least twice. Now speaking from experience, that generally means nothing good. Can you give me any information on that?" Jack asked. "The teams did split up, according to Major Rivers." Ian commented. "Sir. Ah, we split up a few hours ago, SG-1 was investigating...what was it Stan?" There was a pause from Coffin, before he resumed "P98-T8R. The database had only those two addresses on hand, I went for this one, Colonel Mitchell said they would take the other." "Get back to SG-12, check in with Rivers, and if he hasn't heard from SG-1, I want both teams to drop whatever you're doing and report back here. They might've run into trouble on P9-whatever." Jack ordered. "Roger that, sir. We'll get right on it. Sir, to answer Chief Harriman's first question, we don't have a sample, but we have an Ancient artifact that they'll want to look over for sure. But it's a straight shot from the gate to the site, can't miss it. Nothing between that and the site." Brian said. "Understood, Captain. We'll take care of getting a team to investigate the site, you just get back to SG-12. SGC out." Ian said. "SG-7 over and out." Brian replied, and the gate shut. "Anne made a good point, I had to follow it up. Is SG-7 able to handle this kind of thing or do we need another team? I know the Brits should be able to do this." Jack asked. "I checked their files before I had this mission made, so yes. Even the two civilians on their team are ex-Special Forces. And an SAR op is right up Captain Coffin's alley, he's Air Force CRO." Ian replied. "Good. Knowing Mitchell and Daniel, I'd wager they've probably found something that just got them into all manner of trouble." Jack commented, shaking his head. "SGC this is Sierra Golf One Two, Just hooked up with Sierra Golf Seven, no sign of Colonel Mitchell and his team. But We did recover a Zed P M. And its likely worth sending a Science team here. And an Engineering team with a ladder wouldn't go amiss either. But we found a Puddle Jumper here and we can go after Sierra Golf one if the Admiral gives us the all clear." "Not a problem Admiral.." Than Walter was cut off just as the boss was when General O'Neill came in all in a fluster. It took, with Jack's usual speed of doing things all of three minutes to get all that out of the way. The mentioning of SG1 though was a concern, Walter himself had them nagging in his head way past their scheduled dial in. As soon as SG-7 was dealt with, the gate shut down for perhaps a minute, then the routine fired up again with Walter's regular PA calls. He locked the iris in place until the IDC of Major Rivers was received. "Excuse me a moment sirs." He told both of them. "Major Rivers we've just heard from SG-7 a moment ago. The Admiral and General O'Neill is here, wait one. "He turned to Ian and Jack. "Should we tell them to come home directly Admiral or do either of you need to speak to him?" Jack was about to say something when Ian stepped in to take control of the situation. He understood Jack's concerns, but they needed a clear head. They also had to clear the way, SG-4 and SG-18 were due back soon. "Major Rivers, this is Admiral McRaven. I need you and Captain Coffin to rally your teams and come on home right now. We've got two more teams inbound right now and they're probably getting a busy signal. We'll deal with your camp when we send a follow-up team." Ian said. "Open the iris and let them through. As soon as they're through, close the gate because I have a feeling SG-4 is due back with their plus one. Have their guest taken to the brig, I believe we have our friendly neighborhood NID and CIA reps here to have a chat with him." Ian continued. "What about SG-1?" Jack asked. "We'll turn around SG-18 to check their last known position. If they're being held by someone, that someone is going to wish they'd stayed in bed this morning." Ian replied. "I don't care if I'm at home, I want regular status updates on this situation. I'll have someone from my office take care of putting together your report to the IOA, you've got way too much to go over and still manage this situation." Jack said, already pulling out his phone to send a text message. "You're doing fine, you just got hit with a lot at once, good and bad. We're going to have our work cut out for the rest of the week." "That we will." Ian said as SG-7 came through the gate. SG-12 came through the gate a few moments after SG-7 and they quickly cleared the ramp as the gate shut down, the team was already relaxing, Charlotte and Harly had unzipped their vests and undone their webbing belts, Gary had done the same to his webbing and Fred loosened the straps on his plate carrier as he glanced up to the control toom to see General O'Niell. Each team member switched their weapon saftey's on. Fred waited a moment glancing to the control room once more to see if the two SG teams would be ordered straight to a briefing or to the medical unit to get checked out. After a decent moment or two with Walter watching the procession of team members coming through, he double checked by standing on his toes first, then hit the close button. The gate shut down instantly. "Gate secured." He called over the PA. "Welcome back SG-7 and 12, please report to the briefing room." He scanned his dial in status, noticing an attempted dial in while the gate was open a moment ago. "I think you may be right sir." He added.